• Carl Elefante, FAIA, LEED AP is Quinn Evans Architects’ Director of Sustainable Design and a Principal in the Washington, DC office. He has built an extensive body of work that has defined and shaped the field of sustainable preservation by blending the discipline of historic preservation with sustainable design. • Eric Corey Freed, LEED AP, Hon. FIGP. Founding Principal of grganicARCHITECT, a nationally known award winning architecture and consulting firm, with nearly 20 years of experience in green building and sustainable planning, San Francisco, CA. • Bob Yapp, President, Belvedere School of Hands-on Preservation, Hannabal, Missouri. Yapp founded the Belvedere School for Historic Preservation in July of 2008 dedicated to teaching students from all over North America how to become artisans in the preservation trades. • Gary Jay Saulson, Director of Corporate Real Estate, The PNC Financial Services Group. Gary Jay Saulson is executive vice president and director of Corporate Real Estate for The PNC Financial Services Group where he leads PMC’s Realty Services business unit. Saulson oversees all of PNC’s real estate (approx. 30 million square feet), including property management, construction, occupancy ownership strategies, leasing, and transactions. • Karen Alderman Harbert, President and CEO of the US Chamber of Commerce’s institute for 21st Century Energy, Washington, D.C. In this capacity, Harbert leads the Institute’s efforts to build support for meaningful energy action nationally and internationally through policy development, education, and advocacy. Under Harbert’s leadership, the Energy Institute has evolved into a premier national and increasingly international organization dedicated to advancing a constructive energy agenda and transforming the energy and environmental debate into a widely supported plan of action. The complete list of speakers and events can be found at www.greenwichita.org. During the conference, local individuals, organizations, and businesses are presented with the annual Clean Air and Sustainability Awards for their efforts to improve and preserve air quality in the four-county metro area (Butler, Harvey, Sedgwick, and Sumner Counties) and for incorporating Sustainability measures in their organizational structure. This year, Bauer & Son Construction Company was a recipient of an award for designing and building the first United States Green Building Council’s Leadership in Energy and Environmental Design (LEED) certified home in the City of Wichita. The home was designed to save the homeowner nearly $500 in annual energy costs and will prevent approximately 13,000 Ibs/year of C02 emissions. 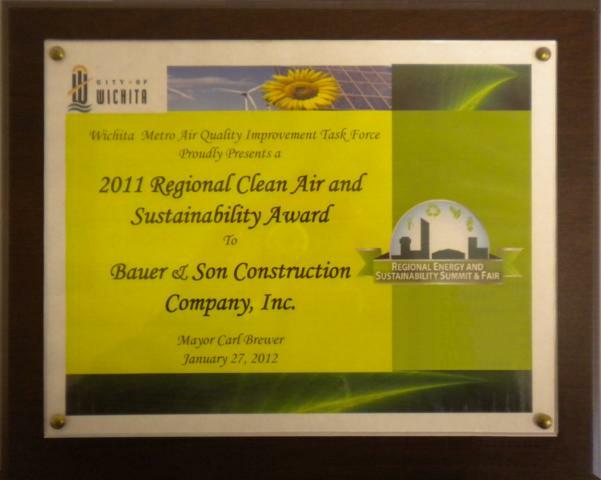 Bauer & Son Construction's Clean Air and Sustainability Award for 1st LEED Certified Home in the City of Wichita. As part of the conference, sponsors and other exhibitors conducted a 2 day Energy & Sustainability Fair. 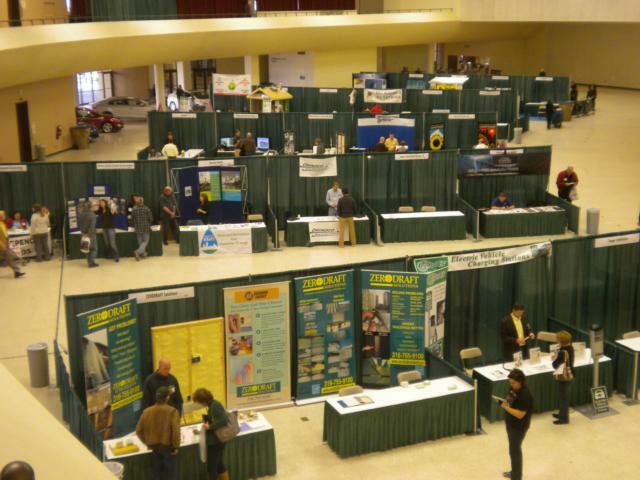 Kansas Preservation, Energy and Sustainability Conference Fair at Century II Exhibition Hall. 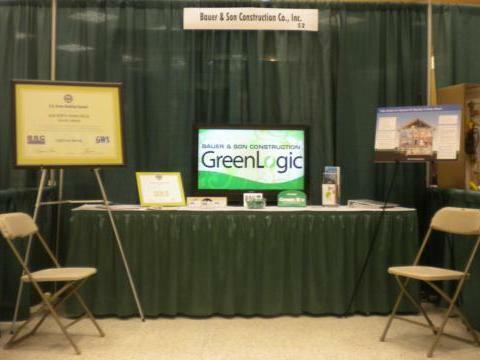 Bauer & Son Construction's booth at the Kansas Preservation, Energy and Sustainability Fair. 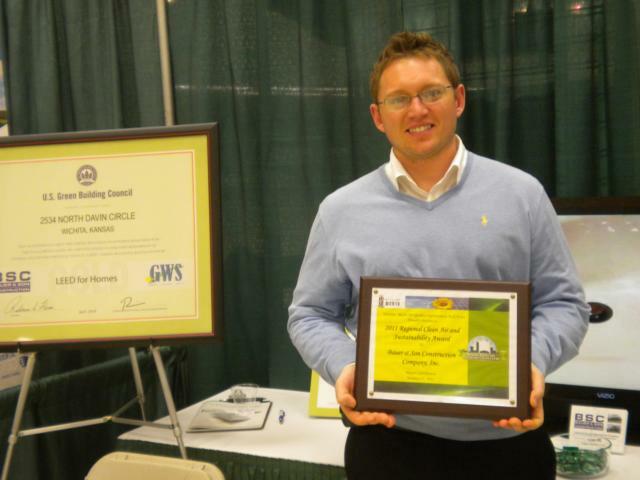 Adam Bauer, with Bauer & Son Construction's Clean and Sustainability Award for the 1st LEED Certified Home in the City of Wichita. This entry was posted on February 13, 2012 at 6:56 pm and is filed under Green Buiding Residential. You can follow any responses to this entry through the RSS 2.0 feed. You can leave a response, or trackback from your own site.